By Ian Angus. I think I have solved a small puzzle in socialist history. Climate & Capitalism’s tagline, “Ecosocialism or barbarism: There is no third way,” is based on the slogan, “Socialism or Barbarism,” which Rosa Luxemburg raised to such great effect during World War I and the subsequent German revolution, and which has been adopted by many socialists since then. The puzzle is: where did the concept come from? Luxemburg’s own account doesn’t hold water, and neither do the attempts of left-wing scholars to explain (or explain away) the confusion in her explanation. 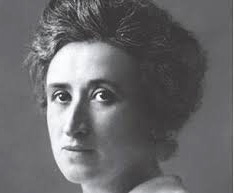 Luxemburg first raised the idea that humanity faced a choice between the victory of socialism and the end of civilization in a powerful antiwar pamphlet she wrote in prison in 1915. The Crisis in German Social Democracy – better known as The Junius Pamphlet, after the pen name she used to avoid prosecution – played a key role in educating and organizing a revolutionary left opposition to the pro-war leadership of the German Social Democratic Party. Here’s the problem: Despite many careful searches through his published and unpublished works, no one has found the words that Friedrich Engels supposedly said. So what’s going on? First, we should note that the English translation incorrectly puts quotation marks around the sentence Luxemburg attributed to Engels. Those marks do not appear in her German text, which indicates that she wasn’t offering a direct quote, and we shouldn’t expect to find those exact words in Engels. That’s even more the case because she was writing in prison, with limited access to socialist books, so we must make allowances for memory errors. With that in mind, let’s look at the suggestions three scholars have made for passages that Luxemburg might have had in mind when she attributed the sentence “Bourgeois society stands at the crossroads, either transition to socialism or regression into barbarism,” to Engels. Although that passage expresses a related idea, there are three serious objections to it as Luxemburg’s source. First, her wording is so different from the Manifesto’s that it’s hard to imagine her getting it so wrong, even quoting from memory. Second, it’s unlikely that she would attribute a passage from Marx & Engels’ best-known collaboration to Engels alone. And third, the standard English translation I’ve quoted above, which Hudis and Anderson also use, omits three important words that appear after “as Friedrich Engels foresaw it a generation ago” in the original German: vor vierzig Jahren. Surely no one writing in 1915 would refer to 1848, when the Manifesto was published, as forty years ago. Forty years would go back to the mid-1870s, which directs our attention to Anti-Dühring, which Engels published in serial form in 1877-78, and as a book in 1879. Since it was the most comprehensive statement of the Marxist worldview written by either of the movement’s founders, it’s a reasonable place to look for quotes similar to the one Luxemburg attributed to Engels – and two scholars have done just that. In The Legacy of Rosa Luxemburg, Norman Geras suggests that she was “probably” referring to a passage in which Engels disputes Dühring’s claim that force, not economic development, is the dominant factor in history. Engels argues that attempts to use force to turn back economic progress have almost always failed, except in a few “isolated cases of conquest, in which the more barbarian conquerors exterminated or drove out the population of a country and laid waste or allowed to go to ruin productive forces which they did not know how to use.” As an example, he cites the Christian invaders who let advanced irrigation systems decay after they overthrew Muslim rule in Spain. That passage does discuss a disastrous conflict between civilization (Muslims) and barbarians (Christians) which the latter won, but it says nothing about capitalism or socialism, nor did Engels draw the general conclusion Luxemburg attributes to him. Nice try, but it doesn’t work. That’s a reasonable conclusion, but I think it’s wrong. For one thing, the idea that Luxemburg invented the expression in 1915 is contradicted by her assertion that “we have all probably read and repeated these words thoughtlessly.” It is clear that she expected her readers to be familiar with the phrase: it wasn’t something new and strange. And that means there was a third-party source. The search for Luxemburg’s quotation in Engels’ works is bound to fail, because he didn’t say it. The problem isn’t misquotation, it is misattribution. The author of the sentence Luxemburg quotes, and of the “socialism or barbarism” concept more generally, was not Engels, but the man who was widely viewed as the most authoritative Marxist theoretician after Marx and Engels – Karl Kautsky. The German Social Democratic Party (SPD) was founded in 1875 as a merger between Marxists and followers of Ferdinand Lassalle, with a program that was broadly socialist but not Marxist. 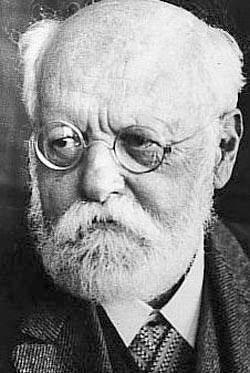 In 1891 Karl Kautsky and Eduard Bernstein drafted a Marxist program that Kautsky rewrote after public discussion: it was adopted at a party congress in Erfurt that year. 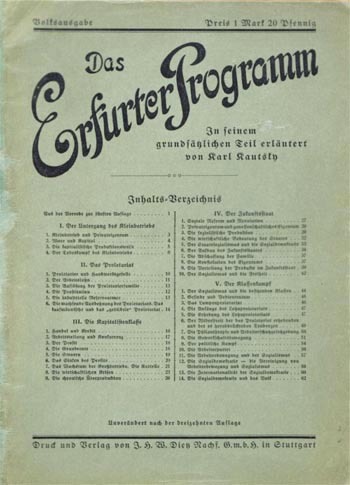 The Erfurt Program, as it was known, remained the SPD’s official program until after World War I, and was widely used by socialist parties in other countries as a model: Lenin, for example, based his 1896 draft program for Russian socialists on it. The program itself was deliberately brief – just over 1300 words in English translation – with little in the way of explanation or argument, so Kautsky then wrote a book-length popular commentary on it, explaining the program and arguing the case for socialism. Das Erfurter Programm in seinem grundsätzlichen Teil erläutert (The Erfurt Program: A Discussion of Fundamentals) was published in 1892. Historian Donald Sassoon writes that the program “became one of the most widely read texts of socialist activists throughout Europe” and Kautsky’s commentary “was translated into sixteen languages before 1914 and became the accepted popular summa of Marxism” around the world. “If indeed the socialist commonwealth were an impossibility, then mankind would be cut off from all further economic development. In that event modern society would decay, as did the Roman empire nearly two thousand years ago, and finally relapse into barbarism. Luxemburg has used nouns instead of verbs, but otherwise the two are the same. So why did Rosa attribute the “socialism or barbarism” idea to Engels instead of Kautsky? It’s impossible to know for sure, but it seems likely that after two decades of wide use as the popular explanation of socialism, many of the concepts and forms of expression in Kautsky’s book had become common currency in socialist circles, to the point where the words were detached from their specific origin. Think of the many quotations that are wrongly attributed to Albert Einstein, and you’ll have an idea of how Kautsky’s phrase could be credited to Engels. When she quoted it from memory in prison in 1915, Rosa Luxemburg made an informed (but wrong) guess that the most likely place to find it would be Anti-Dühring, so she added the “40 years ago” reference. Her pamphlet then had to be printed in Switzerland and circulated illegally in Germany, so detailed source-checking wasn’t on the agenda. Kautsky’s authorship of “socialism or barbarism” wasn’t identified before this, I suspect, because after he condemned the Bolshevik revolution, socialists stopped reading Kautsky. As someone has joked, thanks to Lenin’s polemic many people think that Kautsky’s given name was Renegade. Most of his works are now out of print or available only in German in expensive academic editions. As this case shows, that neglect has made it more difficult to understand Luxemburg. If I’m correct, then Michael Löwy is wrong to suggest that Luxemburg “invented, in the strong sense of the word, the expression ‘socialism or barbarism.’” Rather, she wrote “we have all probably read and repeated these words” because that was the simple truth – as a result of Kautsky’s widely-read book, the idea that humanity must move forward into socialism or fall back to barbarism was already well-known among socialists in Germany. Her great contribution was to give “socialism or barbarism” a more immediate and profound revolutionary meaning than the original author intended. The words came from Karl Kautsky, but Rosa Luxemburg gave them wings. Ian Angus is editor of the ecosocialist journal Climate & Capitalism. Rosa Luxemburg’s The Junius Pamphlet – The Crisis in German Social Democracy is posted in the Marxist Internet Archive in English and German, and is available in many printed anthologies. Every English version that I’ve seen includes the errors and omissions described above. Some examples of quotations that are inaccurately attributed to Einstein are here. Friedrich Engels. Herr Eugen Dühring’s Revolution in Science (Anti-Dühring). Progress Publishers, 1969. Also in Marx Engels Collected Works, Volume 25, and in the Marxist Internet Archive. Peter Hudis and Kevin B. Anderson, editors. The Rosa Luxemburg Reader. Monthly Review Press, 2004. Michael Löwy. “The spark ignites in the action – the philosophy of praxis in the thought of Rosa Luxemburg.” International Viewpoint, May 2011. Donald Sassoon. One Hundred Years of Socialism. New Press, 1996. Thanks for publicising Ian Angus’ detective work, which is probably a revelation for those who don’t read German. But his opening sentence, “I think I have solved a small puzzle in socialist history”, should be modified to ‘. . . in Anglophone historiography’. His opening paragraph, on the SPD siding with barbarism in World War One, says in a matter-of-fact way that “In der von Kautsky einst formulierten Alternative Sozialismus oder Barbarei (die später von Rosa Luxemburg wieder aufgenommen wurde) hatten die sozialdemokratischen Parteien sich auf die Seite der Barbarei geschlagen. ” (. . . that RL would later take up). The quotation Geras cites comes from Chapter 16 of Anti-Dühring. The one that Löwy cites is from Chapter 13. There is also a passage in Chapter 14 in which Engels argues the bourgeoisie’s “own productive forces have grown beyond its control, and, as if necessitated by a law of nature, are driving the whole of bourgeois society towards ruin, or revolution.” http://www.marxists.org/archive/marx/works/1877/anti-duhring/ch14.htm I believe that Hal Draper suggests that this may have been what Luxemburg had in mind. It’s closer than the other two, but Ian’s explanation looks right to me. Hi. Thanks for the article. I want to translate this into Korean and put that up in my personal blog(also in FB), so others can read it better. Is it ok to do? A couple of thoughts inspired by your discussion. First, you are right to emphasize how crucial The Erfurt Program was — in Russia, for example, it simply was the basic definition of Social Democracy, and more influential a piece of writing than anything written by Russian Marxists themselves. It was still being used as a textbook at least in the twenties. Look at the Appendix in Moira Donald’s book that lists Russian publications of Kautsky. You are curious about what are the abridgments and distortions I found in the existing English translation. It’s been a while, but as I recall, it was more a paragraph by paragraph thing — this line left out, this thought simplified, etc. Again, as I recall, the words “Social Democracy” were simply removed, and replaced, I think, by “socialism.” So, when people read it today, they often don’t realize Kautsky is talking about a specific movement and party, not just a vague doctrine. — And, of course, the title is changed! Why did Rosa get the attribution wrong? I’m thinking, for the same reason that you suggest for later writers: she unconsciously was reluctant to grant authority to Kautsky, whom she now despised. Lenin was willing to give the earlier Kautsky much credit — as I have documented — but, evidently, Luxemburg had more “cognitive dissonance” about admitting she had learned from someone like Kautsky. By the way, your post joins in a larger movement to bring Kautsky back — not only my own stuff on Lenin, but the anthologies edited by Day and Gaido, Ben Lewis at the Weekly Worker, and others. I think your post makes in a striking way the point all of us are making: socialist history is distorted by our ignorance and contempt of Kautsky. Anyway, thanks for making the discovery and writing it up in clear and compelling fashion! “Thus it is always the historic milieu of modern imperialism that determines the character of the war in the individual countries, and this milieu makes a war of national self-defence impossible. Ian’s hypothesis that the phrase had become common currency and its origin forgotten is a better one. Or it may be that Luxemburg simply made a mistake, just as we might wrongly attribute something Lenin said to Trotsky, or vice versa, even if we hold both of them in high esteem. “Luxemburg has used nouns instead of verbs, but otherwise the two are the same.” Just for the record, those are adverbs, not verbs. Hope that was just a typo. It’s not the most important debate we could have, but my dictionary defines both “move forward” and “fall back” as intransitive verbs. “The Road to Power” – wasn’t that the title of Kautsky’s book on the Erfurt Program? Charles H. Kerr published this as well as several other of Kautsky’s works before WWI, including The Social Revolution, Ethics and The Materialist Conception of History and others. His work on Thomas More’s Utopia may have been out then as well. Generations of American socialists were raised on these works before the Russian Revolution, including those who would go on to join the Communist Party. I was certainly struck when I first notice a year ago that the quotation on socialism or barbarism had its origins there. But there are clear influences of Kautsky’s teaching and writings in Joseph Freeman, Bertram Wolfe and a dozen others once you are familiar with Kautsky’s work. Of equal loss to the modern movement was the once prevalent familiarity with Kropotkin’s Mutual Aid and Joseph Dietzgen’s Positive Outcome of Philosophy(who disappeared from left intellectuals shelves when Lenin’s Materialism and Empirio Criticism was published with its brief unkind reference to Dietzgen although Lenin praised him in other works, written before and after. You may remember the period because AWL comrades had been involved in the Vestas wind turbine factory occupation – perhaps the high point of socialist ecology so far in the UK. I recall you spoke at an ecosocialist conference in London organised by Socialist Resistance. Our comrades offered to speak, but sadly the sectarianism of Socialist Resistance meant they excluded us (without having exactly excelled themselves in the Vestas struggle). I enjoy reading the material on your climate change website, but I find the amalgam of post-Trotsky Trotskyism with Stalinism, Guevarism, Chavismo etc excruciatingly unhelpful for recasting socialism for the 21st century. You appear to fillet class from emancipation. The potential for a global working class-based climate movement is enormous – but the Marxist left needs to slough off much of the ‘conventional wisdom’ your book regurgitates.